FOR THE past four weeks, I have left my dorm room and started commuting daily from Quezon City, where my brother lives, to Manila, where I work. It has taken me about an hour--two hours tops--to traverse Quezon Avenue into the perpetually congested España Avenue, which flows either to Lacson Avenue (which is, after office hours and at night, populated by huge delivery trucks and is almost rendered impassable), or to Quiapo, where the jeepneys use half of the road as parking space. WHILE rereading my private journal (I do a lot of private writing, though not nearly enough), I saw my entry for December 6, 2014, on God's "forgetfulness" and faithfulness. I'M glad my second year of residency is over. Since the start of the year, I've transferred to the Senior Residents' Callroom (SRO), literally in the landing between Wards 1 (on the first floor) and 2 (the Surgery ward, on the second). Just when I thought the Second Year Callroom was going to end up in my book as the best quarter of my residency years—we transfer callrooms every year, if that isn't obvious to you yet—the SRO has emerged as the eventual winner: it's more spacious, it has a bathroom of its own. Natural light seeps through in the mornings. The PGH Wifi connection is arguably faster, too. I inherited Kevin Bismark's desk, a testimony that he has lived his final year in IM with travels, trips to the dentist, and a lot of studying. I had to set some of his things aside to let mine in (he is, as far as I know, still traveling): a few books, my laptop, toothbrush, a desktop sharpener, a collection of pencils inside a Malacañang mug given by an OPD patient, my actual coffee mug given by a different patient now dead—the same patient who called me "the best doctor in PGH" and gave me a plaque for it. Embossed on it is his artistry: he made caricatures with colored glues on various surfaces for a living, and despite being easily fatigued, he took the time to remember me. I miss seeing him in my clinic. You'll see another plaque, too—one that bears "Best Doctor in the World," which my aspergilloma patient gave me two years ago. I don't believe that I deserve these plaques at all, but I'm grateful. Truly. ONE thing that excites me in Toxicology is the ringing of the phone and what the other person on the other line might ask next. I've been manning the National Poison Management and Control Center since the start of the month as part of my rotation in Toxicology. The duty schedule is hectic for my senior year—24-shifts every three days, with no true post-duty (or "from-duty," as my non-PGH colleagues say) status. My stay entails that I provide telephone support and medical advice to physicians and laymen all over the country about all things related to poisoning. This means, of course, that I must know the active substances of popular products. My knowledge, I've realized, is limited. Thankfully, however, beside the three phones in the office are the Pandora's boxes of precious toxicologic knowledge. Whereas online databases can only give us so much information, this collection of 6x8 cm index cards, many of them dirtied by the patina of time, provides the answers as to the active ingredients of katol (pyrethrin), Johnson's cologne (phenoxyethanol), and glue gun (non-toxic at all). I've received calls about a farmer who swallowed a sachet of pesticide after fighting with his wife. Many such ingestions fill our daily census, which the office forwards to the Department of Health at the end of the year. There are cobra bites in Bohol, sodium hypochlorite (Zonrox being the most popular brand) ingested by depressed people all over the country, noxious gas exposures of elementary school students in Central Luzon, and, the most memorable of all, a petroleum ingestion by a cat owned by a horrified, distressed young lady. The most important detail I ask is the type of poison, if the substance is poisonous at all. The next details I ask are mainly related to the circumstances leading to the exposure: whether it was accidental or not, where it happened, and how the patient was doing. The rest of the information are for the completion of our census. Receiving calls from complete strangers feels like being a night-time radio talk show host. The simile stands: people really phone in to get sound advice, knowing they'll get better with the knowledge that an expert has heard and processed their concerns. I suppose, if we broadcast these calls—barring expulsion from the practice of medicine due to disclosure of confidential information—we'd be a hit. Imagine the possibilities: The Toxicology Radio Program! You have broken hearts? Don't swallow a thousand of those pills—just give us a call! YESTERDAY was my first Adult Medicine CAT presentation, as senior, with Jaja Saliba, Butch Roque, Berbi Berba, Josh Cruz, and Racquel Bruno (in absentia). We tackled mortality in transfusing short- versus long-term storage blood . A great, fruitful discussion. (There's no difference in mortality rates.) It was also wonderful to have Dr. Tony Dans back. millennials — Just another word, I suppose, for self-absorbed people. I think this distinction—calling people Generation X, Y, or millennial based on the year they were born—is all made up. netizens — I prefer “internet users,” or “people” in general. Everyone I know has encountered the internet at some point. twinning — Use “twins.” This is acceptable, though, when talking about some process after fertilization. adulting — It sounds so immature. I’ll only use this if pediatric-ting becomes a thing, too. I discovered another quiet coffee place. It has wide, wooden, tables; chairs of the right height; adequate lighting; tolerable internet connection. It's devoid of noisy teenagers and hipsters. As with most shops, it offers discount cards, and this one was too beautiful to pass up. We live in a beautiful country. That's something we don't thank God enough for. WE get all sorts of referrals in Toxicology, where I’m rotating for a month. They're mostly non-accidental ingestions of people going through depression. One night, though, we received two referrals at the Pediatric ER. Two children, both around eight years old, were brought to the hospital because they had batteries lodged in each of their right nostrils. This was an actual battery that our friends from ENT took out. I hope the kids learned their lesson. But kids being kids, they probably didn't. 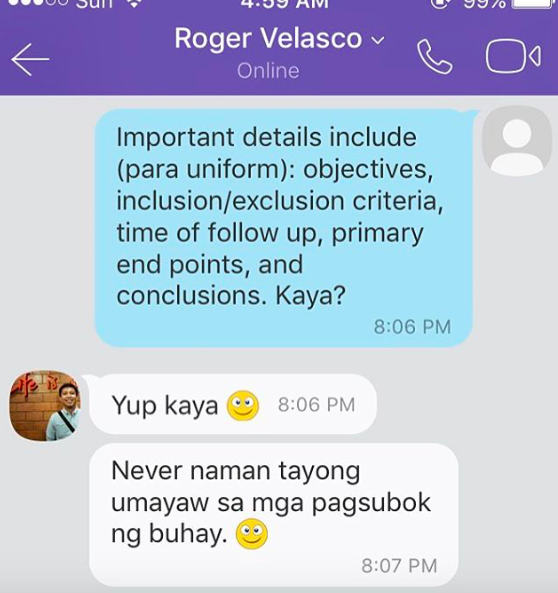 My good friend, Roger Velasco, makes me howl in laughter, even through Viber. Isa pala akong pagsubok na kailangang harapin, Rog? Alam natin 'yan! Kaya dapat tayo ang laging magkatabi sa OPD! “She’s trembling, Lance—your Lola Ugól,” Auntie Net, the librarian, said. Lola, in her early eighties, has been intermittently living with her in General Santos City, about an hour’s drive from Banga, South Cotabato, where our ancestral home is. Auntie Net would pick her up on weekends, then bring her back after two weeks or so, where Lola could be near her farm and friends.